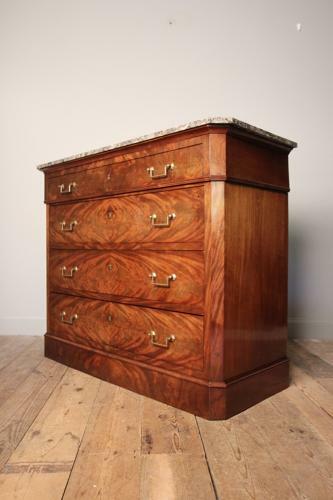 A flamed Mahogany Louis Philippe Commode Chest, having outstanding colour with flamed Mahogany drawers retaining the original finish throughout. The 4 graduated drawers with brass handles and escutcheons, flanked by canted sides and raised on a plinth base. Retaining the beautiful original marble top. The whole in superb original condition throughout. French, Circa 1880.